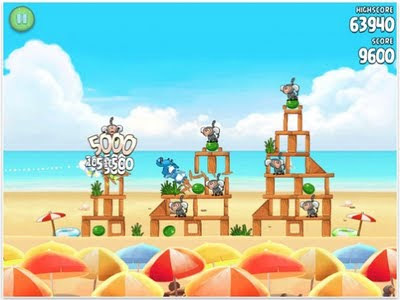 Rivio's Angry Birds Rio has been updated to include the 30 new Beach Volley levels. The update is available now for iPhone, iPad, and iPod touch. Angry Birds Rio for iPhone/iPod touch is $.99; the Angry Birds Rio HD edition for iPad is $2.99. The upgrade with the new levels is free to all existing Angry Birds Rio customers. Angry Birds Rio, like other versions of the Angry Birds franchise, includes Game Center achievements and new hidden fruits to find. Once you have completed episode one, Blu and Jewel will be added to your avian arsenal. Rovio has also released a free edition of Angry Birds Rio which features three levels per episode. Google Android and HP webOS users, unfortunately, still have to wait for Rovio to release the Beach Volley update. Your request (#29584) has been updated. You can also add a comment by replying to this email. and thank you for your patience in waiting for an answer from us. We have been investigating performance issues on Palm devices for a long time now. Palm Pre and Pre Plus have some severe firmware issues which prevent latest versions of Angry Birds running properly. Unfortunately Palm has decided not to support them with firmware updates anymore. We are working very hard to solve those issues but unfortunately can not guarantee Angry Birds games to work perfectly on those devices. The good thing is that when Palm is starting to roll out new devices, we will be able to support them all. : If it is true there will be no more updates for any of the Angry Birds on my Palm Pre Plus then I would like a refund please. Nice to know!! Especially since they already have my $1.99. The game played fine on my Pre Plus, the two levels I have anyway; I just won't be getting the updates the rest of the world will. Because I bought a Palm! I hope HP/Palm/Rovio enjoyed spending my $1.99, they will never get another penny of my money. I wouldn't have bought ABR if I'd known I was only going to get two levels! My contract is up next month and this faithful Palm user (since Treo 600) is buying an iPhone. I'm thinking, "Class action lawsuit." Who's with me? If Rovio is not going to support the Palm Pre with updates for RIO then they need to remove the game you pay for. I would never have gotten the game if I knew this. Yeah, class action suit.